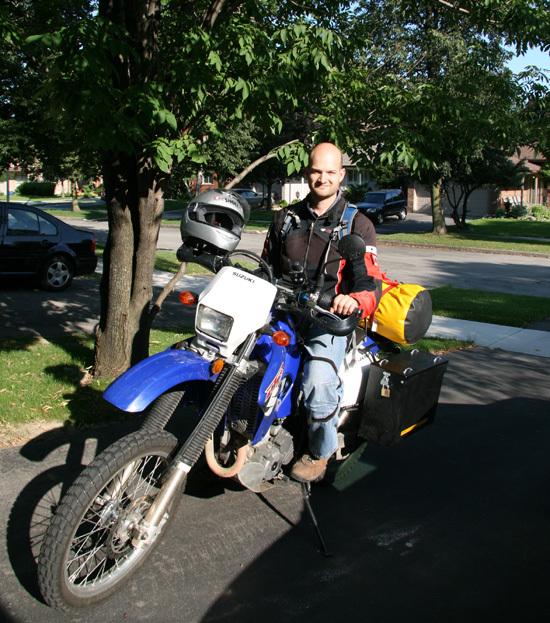 I am finally off on my two-wheeled trip across the Canadian heartland. It is only day 2 and I’ve already almost run out of gas twice. On the last trip I made it all the way to South Africa before running out of gas for the first time. What is going on? Well for one, I will admit that I have a little bit more packed onto my bike than Macher would approve of. But in my defense I am going to be living away for 6 weeks of electives. So I have some books, more clothes than I have an excuse for, and even this computer. The extra weight, combined with a strong headwind, and cruising at 125-130 km/h on the 400 resulted in the bike sputtering out at only 150 km since the last fill! I thought I would at least make it 200 km before going into reserve. Almost out of gas in the middle of nowhere. I had to resort to my Garmin GPS while still only a couple of hours outside of Toronto to try to find the closest gas station. Unfortunately the nearest gas station turned out to be a 30 km backtrack. According to the GPS, the next gas station in my direction was over 80 km away. It shames me to have had to break the number one rule of motorcycle touring so soon on my trip (“Thous shalt not backtrack”). It was either that or hitchhiking though. I almost ran out of gas later on because I didn’t realize that after about 6 or 7 PM almost all of the gas stations would be closed. I had to ride the last 150 kilometres into Sudbury at 85 km/h to try and conserve fuel. Luckily I made it to 223 km before switching to reserve. I wanted to reward myself for the cold night ride into Sudbury (I had a late departure and it was just befoe 10 PM by the time I got there) with a nice steak dinner before finding a place to spend the night. Unfortunately, everything seemed to be closed. I eventually stopped at a Travelodge with a Perkins restaurant attached and when I asked if the restaurant was still open the attendant looked at me like I was crazy. “Is there anything open in Sudbury where I could eat at this hour?” I asked. Next I asked if there was a place to camp nearby and he really looked at me like I was speaking another language. I guess people don’t normally come to Sudbury to camp. I used the GPS to find a tavern hoping that perhaps they would serve some bar food. In the end I ended up at a fine bar called the “Smiling Buddha” with a great beer selection and an open kitchen. So to set the record straight – yes you can eat at 10 PM or even midnight in Sudbury. And you can wash your meal down with a bottle of Unibroue “La Fin du Monde” if you should so choose. I ended up splurging for a fine room at the Quality Inn just down the street. When I woke up this (late) morning, it was as dark as Mordor outside and threatening to deluge. Riding through Sudbury in the dim daylight on the ride out I felt as though I actually was in Mordor. Cool. 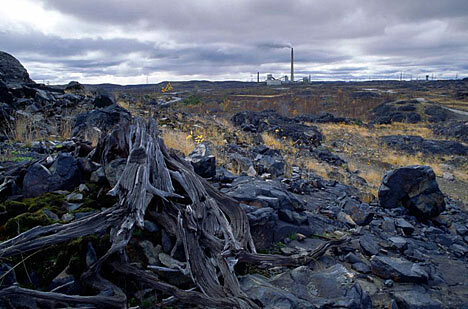 Nickel Mine (aka Mordor), Sudbury, ON. Because of my late start on Day 1, I was hoping to make it all the way to Thunder Bay on Day 2. Alas, I had another late start (or put another way a wonderful sleep). My decision to stop in Sault Ste Marie was made much easier by the horrible weather. It has been cold and raining all day. I wish I had my electric vest. Without an electric vest, the ride to Thunder Bay in the cold downpour would be miserable indeed. 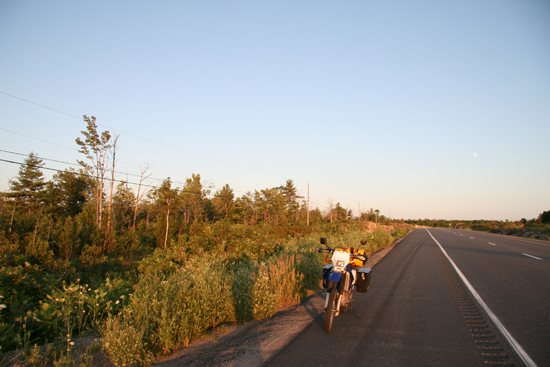 Also I have been told that the north shore of Lake Superior is beautiful, and I would like to do the ride in nice weather during the day (which will hopefully be the case tomorrow). 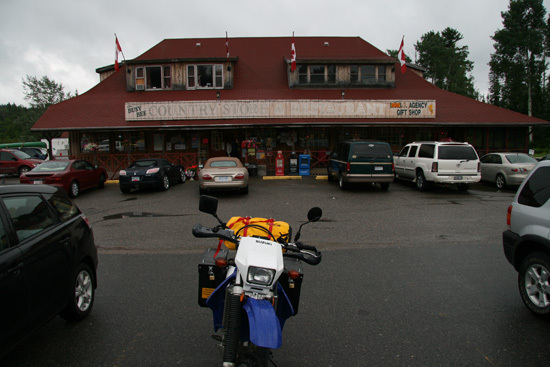 The rain stopped for a few minutes today so I snapped this picture of the Busy Bee Restaurant where I had a hearty Lumberjack Breakfast and coffee on the TransCanada about 50 km or so west of Sudbury. OMG – I never would have imagined such an exotic location for your next ride!! 😉 I guess it is true that sometimes we forget our back yard when we are looking out to see the world. I’m sure there will be some interesting comparisons with the rest of the world (save Russia) to come.